Every year in the heat of the summer, we can tomatoes. 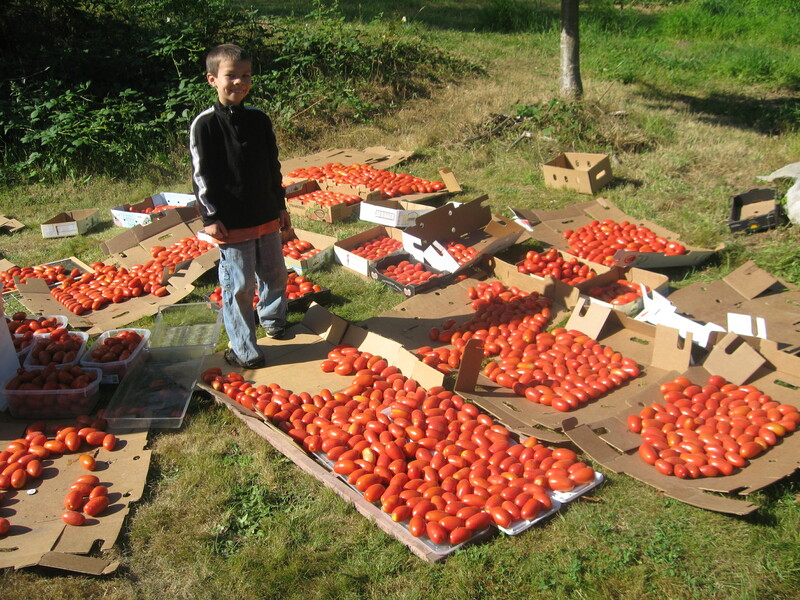 Lots of tomatoes. 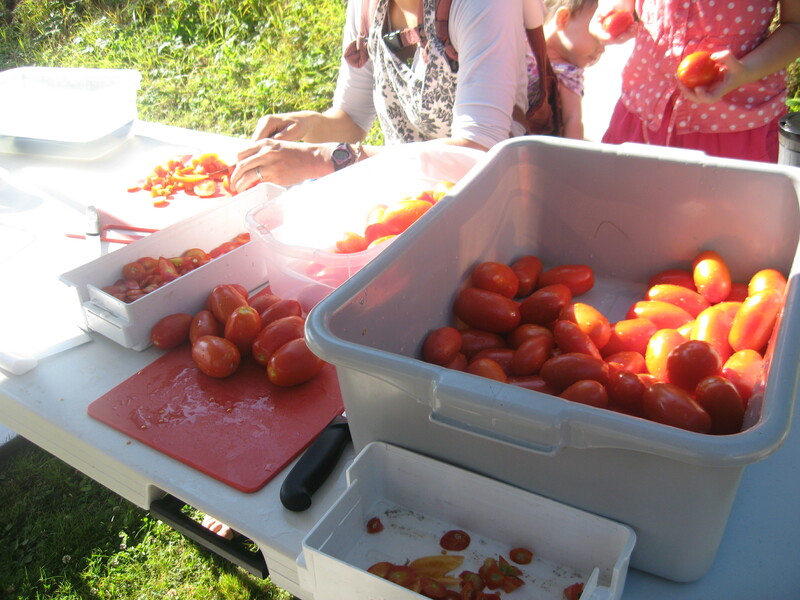 Tomatoes in quantities vast enough to feed a small army – which, come to think of it, is exactly what I do with them. Tomatoes are not hard to put up; we generally get it all done in a day or two. 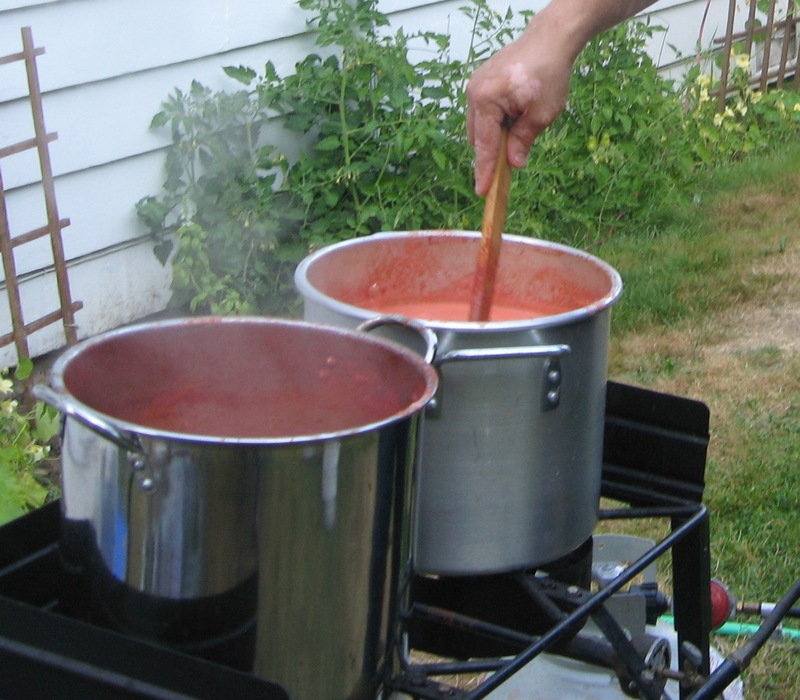 I try to make sure we have enough tomatoes on hand to make all the enchilada sauce, pizza and spaghetti sauce, curry, soup, or whatever might require canned tomatoes… for the full year until tomato season comes around again. 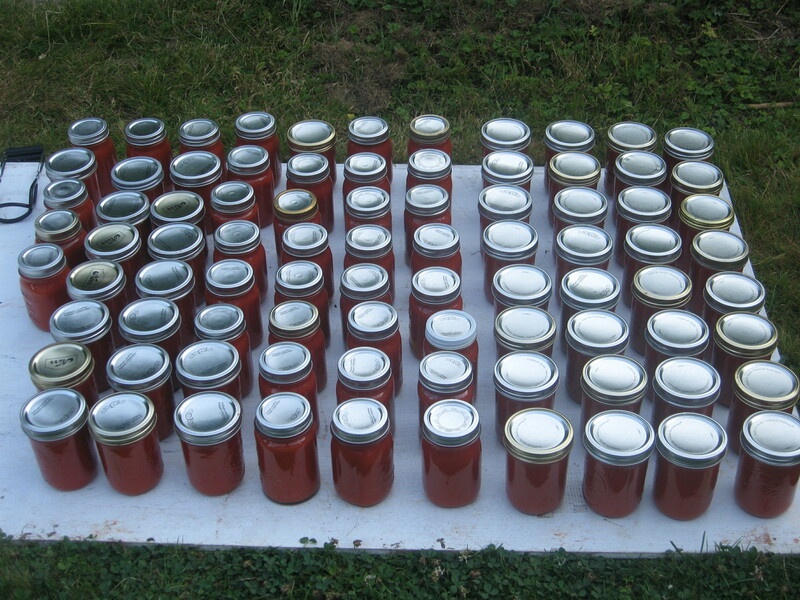 I buy organic roma tomatoes for canning; they have less water content than beefsteaks. I purchase them directly from my favorite farmer, who does a lot of bulk sales. I’m grateful, as the average farmer at farmer’s market tends to look a bit aghast when I waltz up and ask if I can order 400 or more pounds. This year, Mrs. S and I teamed up and did our tomatoes together. Our long-suffering husbands were dragooned into the effort. We ordered 470 pounds and made sauce with roughly 3/4 of them. The rest were diced. One concern with tomatoes is acidity. If the pH is higher than 4.6, then the choices are to either add acid in the form of lemon juice or citric acid, or pressure can them. All you science types out there know that as pH gets higher, the numbers get lower, but this still seems odd to me. I get it, it’s just odd. 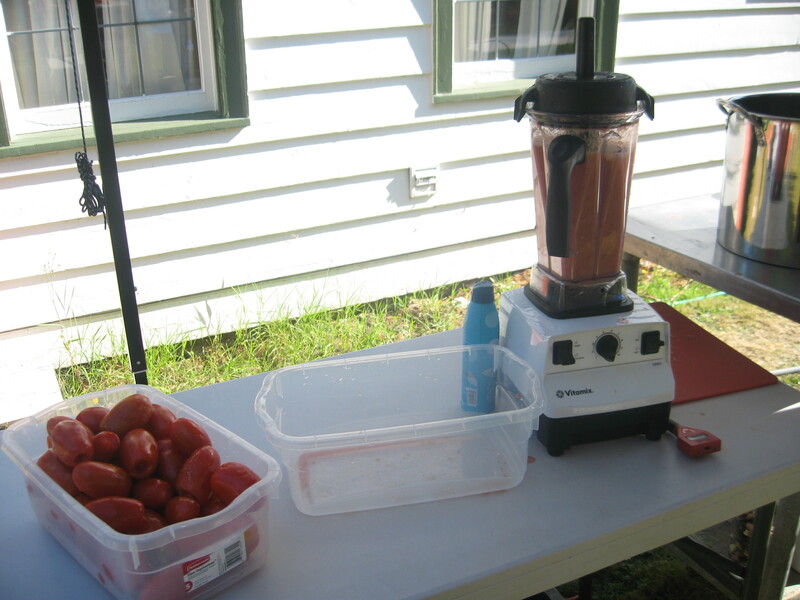 Anyway – your average home cook does not have the equipment to test the pH of tomatoes. Pool test strips won’t work because pools aren’t supposed to get that acidic. Not to worry – my great friend Mrs. T came to my rescue, with a food acidity tester from a chemical company. Thanks, Mrs. T! Tester in hand, we found that our tomato pH was 4.2, give or take a tenth. This is well within water bath safety ranges, so we merrily canned away and didn’t add anything. A scrub in a bin of water treated with about a teaspoon of dish soap, a splash (1/4 c. or so) of white vinegar, and about ten drops of grapefruit seed extract. Rinse in cold water in the next bin. Final rinse in yet another bin of cold water. We go through a lot of water at canning time. 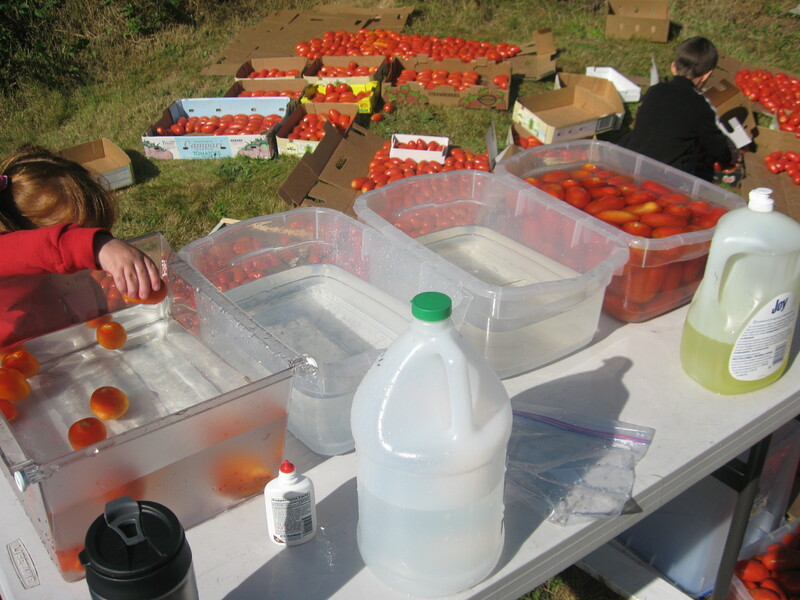 Then the tomatoes go to the processing tables for stem removal. After the stems are off, we blend them for a few minutes. After blending comes the fun part – stirring. The puree goes into pots and gets boiled down to about half its original volume. It has to be stirred. And stirred. And stirred. If it gets left alone for more than a few minutes, it scorches – which is heartbreaking. Don’t ask me how I know this. Once it reaches the stage where its fairly thick, and the bubbles are going “gloop gloop” instead of looking like water boiling, then it’s ready to pour into freshly washed jars. I leave 1/4″ to 1/2″ headspace, and stir to make sure there aren’t any air pockets. The rims are wiped, and two-part lids are screwed on finger-tight. The Ball Blue Book recommends processing pints for 35 minutes and 40 minutes for quarts. After an overnight rest to let the seal harden, we wash the outsides of the jars with warm soapy water, label them, and store them in the pantry. Then we recuperate for a week. The first time I make lasagna, though, it’s all worth it. Do you can tomatoes? On this level of insanity? 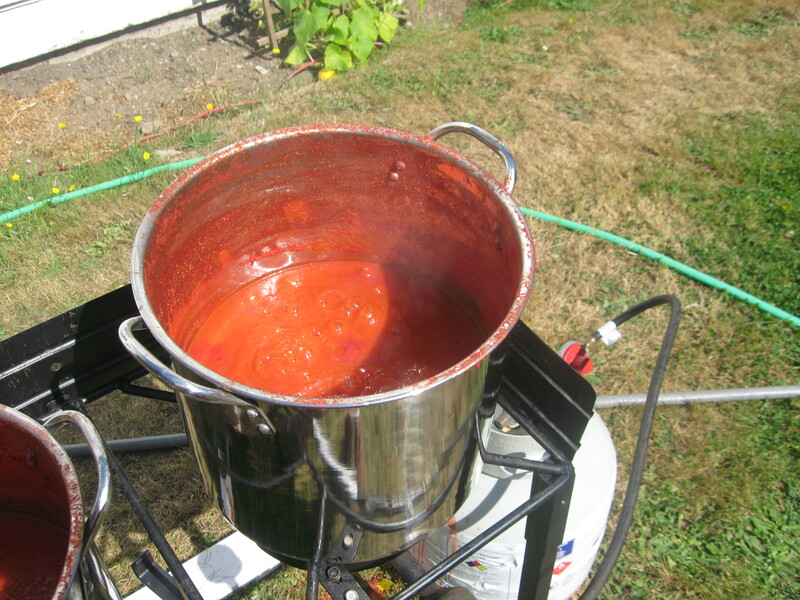 This entry was posted in Canning and tagged Canning, Tomato sauce, Tomatoes. Bookmark the permalink.